Last fall I shared that I’m back into cooking and plan to share my favorite discoveries. While I originally planned to share these recipes monthly, it seems I’m going to give you my favorites every few months. This time, I’ve got recipes I made and LOVED from May and June. None of these recipes are mine, though I tend to tweak every recipe I make. The pictures are mine and I’ll link to the original recipe to give the chef credit. You can try the original recipe or tweak to your delight. Just click on the recipe name to see the original recipe. Here are the recipes I really enjoyed recently (and remembered to snap a picture). These were just amazing. I’ll be making them again. I love oatmeal and am often looking for something sweet that is simple to make and not a traditional dessert. This recipe is my type of recipe. I used my favorite jelly, black raspberry. It’s actually a bit too sweet for me with this jelly, so next time I want to try it with fig jam. I think that would be perfect. Will be trying this again as the oatmeal top/bottom is fabulous. Oh…I did cut down the butter to 4 tbsp…subbed applesauce to keep the moisture level the same. UPDATE: Changed my mind…not too sweet! After about 24 hours, maybe the sweetness mellowed. 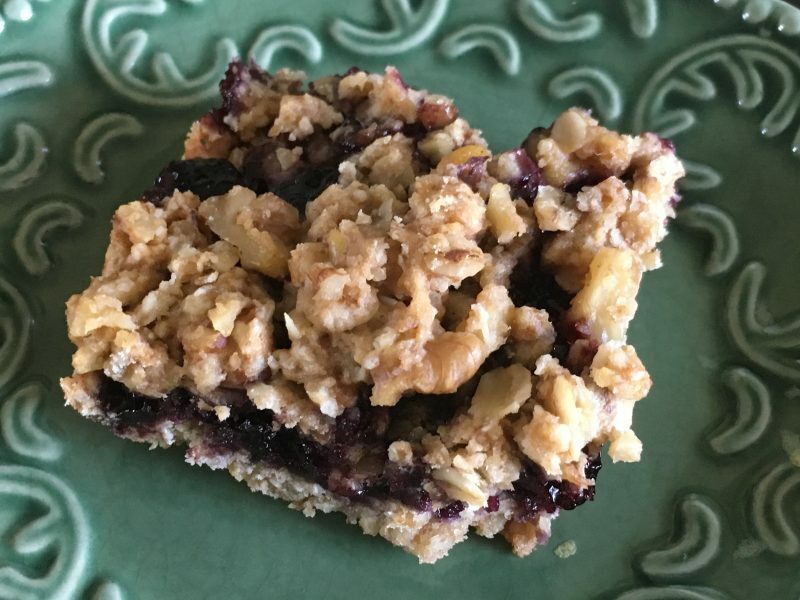 I worked on an 8×8 pan for a week…perfect for breakfast, snack or dessert! I love grilling but am always nervous about overcooking meat. Not so with this recipe. Time to make it for company! 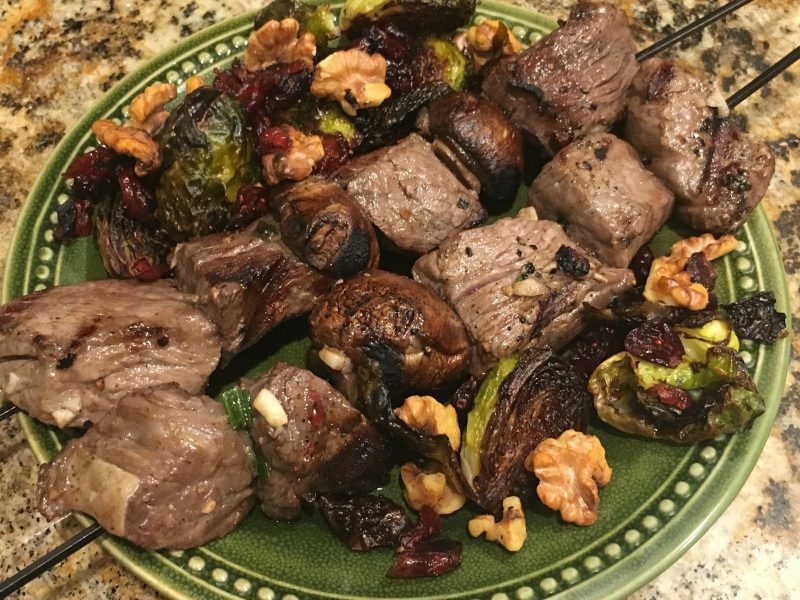 These were great kabobs. I didn’t have any oranges and didn’t want to wait longer to make them, so I used orange pepper in the marinade instead of oranges. Probably would be a strongly flavor with the fruit, but I still really liked it. I added mushrooms to the marinate and let it sit for 24 hours before grilling. Yum! Really good and easy too. This is a nice easy weeknight meal. Leftovers are good too. This was created from scratch for a recipe game I play called RSC. It’s a chopped style game where you are given primary ingredients, pantry ingredients and categories, and you have to come up with a recipe. This was one of the few recipes I wanted to try once they were posted. And glad I did. I’m really impressed that you created this on your own from the RSC ingredients. 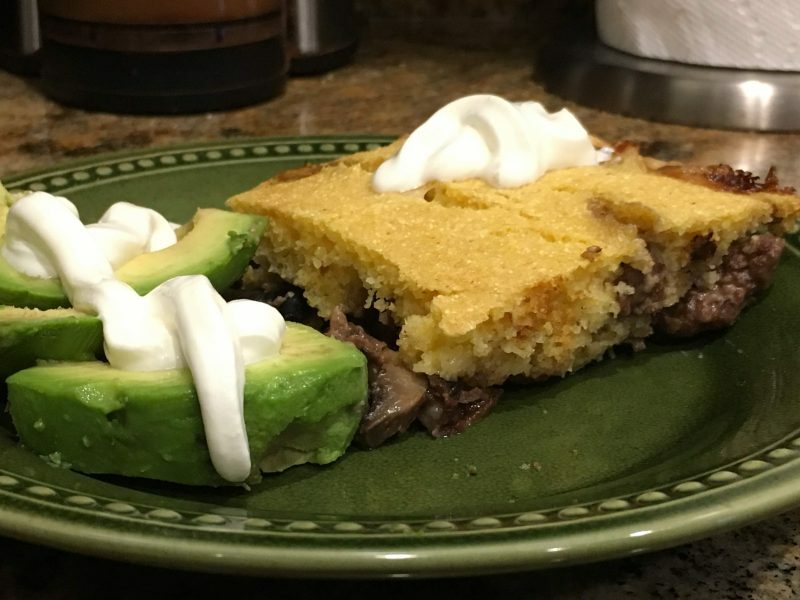 If I was posting it, I might have called it Talamie Casserole because the cornbread top tasted exactly like the cornbread wrapping on the paper wrapped grocery store tamalies my mom made when I was a kid. But the beef filling was much more flavorful. I couldn’t taste the cheese, so I would either add more or even leave it out next time. My only changes were that I left out the tomatoes, pepper and hot sauce, and used sweet white onion rather than red onion. And I cut it in half (still using a whole egg). Yum! Definitely has a Tex-Mex flavor and fabulous served with the avocado and sour cream. I really need to eat more fish, and this was a great way to make it. I used salmon instead of trout, but guessing any fish would do. I think I just found my favorite way to make salmon. This was SO good. I actually used 1 oz of all of the ingredients since I had already gotten the shot glass dirty and didn’t have a clean 1/4 cup. 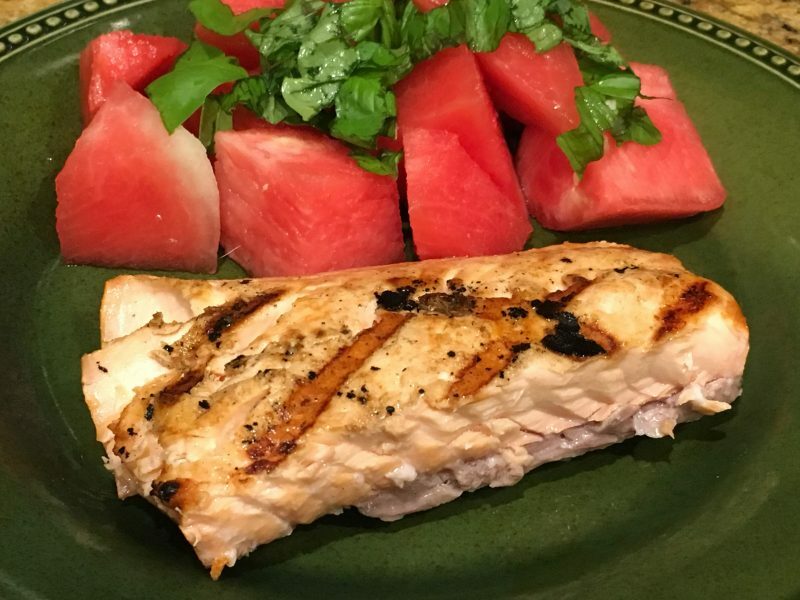 I also used a 1 lb filet of salmon, which made 2 servings. I ate the first one hot, and plan to eat the 2nd one cold. Marinated about 3 hours and then grilled outside with the lid down, skin on one side. FYI…no alcohol flavor if that worries you. Just really flavorful fish. I’ve already got 3 recipes lined up for my July post, so be sure to subscribe for my weekly newsletter (it only goes out if I posted something new since the last one went out).